Spinach cooked with potatoes and seasoned with traditional Indian spices. Mixed vegetables cooked with nuts, mild spices and cream. Homemade cheese cooked in spinach with fresh tomatoes and mild spices. Homemade cottage cheese cooked in a creamy sauce enriched by cashew nuts - a vegetarian’s delight. Cubes of homemade cheese cooked with chopped onions, capsicum, garlic and Indian spices. Homemade cheese stuffed in vegetable balls and cookedin a mildly spiced creamy sauce Vegetable Korma. Fresh vegetable cooked with fresh tomatoes, capsicum,onion, ginger, garlic and herbs. Cubes of homemade cheese cooked in a creamy cashewnut sauce with mild spices, almonds and raisins. Yellow split lentils cooked with cream, ginger, garlic and tomatoes. Black lentil beans cooked with cream, butter, ginger,garlic and tomatoes. Steamed chickpeas cooked with tomatoes, ginger,garlic and spices. Diced potatoes and cauliflower cooked withchopped onions, garlic and spices. Batter fried cottage cheese (paneer) sauteed withdice capsicum, onion, seasoned with soya, chillies and tomato. Spicy lamb curry from the foothills of the Himalayas - lamb cubes cooked in freshly ground spices with onion and spicy gravy. A traditional south Indian dish - Meat pieces cooked in coconut and cashew nut based gravy. Diced pieces of meat cooked in fresh cream with ground almonds, cashew nuts and mint flavour. Boneless lamb pieces cooked in ginger, garlic andfenugreek flavoured sauce. Pieces of boneless meat cooked in spinach with mild spices. Diced pieces of meat cooked in fresh cream with ground almond - sand cream. Favourite from the south of India - highly spiced meatcooked in tangy sauce. Pieces of beef cooked in creamy sauce, oriental spicesand chopped tomatoes in butter. 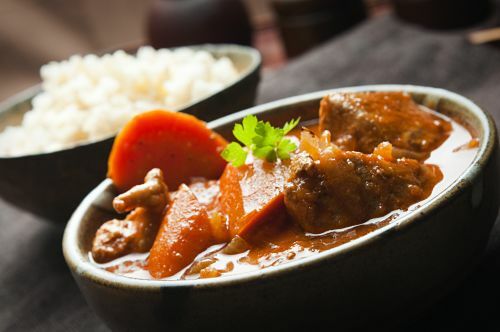 Boneless lamb or beef in a mild creamy sauce. Boneless pieces of chicken cooked in creamy sauce, oriental spices and chopped tomatoes in butter. Pieces of chicken tikka cooked in tangy saucewith tomatoes and oriental spices. Boneless chicken cooked in a mild creamy cashew nut sauce. Diced pieces of meat cooked in fresh cream withground almonds, cashew nuts and mint flavour. Pieces of boneless chicken cooked in a mild fruity mangoflavoured sauce. Tender chicken pieces cooked in medium spiceIndian masala gravy with garlic, onion and capsicum. Cubes of juicy chicken pieces cooked in ginger and garlicin a fenugreek flavoured sauce. Cubes of chicken cooked in an Indian wok withchopped onions, garlic, capsicum and Indian spice. Chicken cooked in spinach with tomatoes and mild spiceswith a flavour of cumin seed and garlic. Boneless cooked in a not so tangy sauce withfried onions and traditional spices. A traditional South Indian dish, boneless chicken piecescooked in coconut-based gravy. Batter fried tender fillets of chicken sauteed withdiced capsicum, onions, seasoned with soya sauce,chillies and tomato sauce. Chicken mince marinated with Indian green herbs andspices, cooked with tomato cheese gravy. Boneless chicken pieces, cooked in yellow lentil gravy,finished with garlic, cumin and cream. Prawns cooked in oriental spices with chopped tomatoes and butter. Prawns cooked in medium spice Indian masala gravy with onion, tomato, capsicum and garlic. Prawn cooked in spinach with tomato, garlic and mild spice. Prawn cooked Indian wok with chopped onion, garlic,capsicum and Indian Garden Special Spices. Pieces of fish cooked with coconut powder, spices and a touch of lemon juice - a delicious dry dish. Pieces of fried cooked in herbs, spices and a touch of lemon juice - a delicious dry dish. Prawns cooked with hot spices in a tangy sauce. Chicken or Lamb pieces cooked with fragrant basmati rice, nuts and topped with nuts and fried onions. Long grain basmati rice sauteed together with shrimp,quality lamb, pieces of chicken and vegetablesin a delicate blend of spices and nuts. Mixed vegetable cooked with fragrant basmati rice,nuts and topped with nuts.